I think it is easier to explain the TIA as an amplifier with a zero input impedance. This amplifier is sensitive to the current flowing from the photodiode, converting current on input to voltage on output. 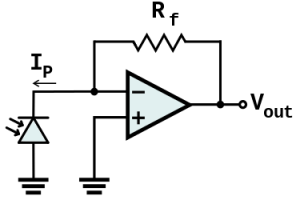 Then, since the input point remains at zero voltage, the parasitic capacitance does not need to be recharged, so there is less input shunting effect from the capacitance. Therefore, the frequency response improves. Yes, but that is a highly simplified explanation and an idealized model. In order to correctly characterize the system, feedback theory must be applied which shows the input impedance of the amplifier is reduced by the amount of feedback (1 + BA). The input impedance become zero only if the open-loop gain of the amplifier is extremely large (essentially infinite). In this case, the open-loop gain of the amplifier is only ~15V/V. Yes, that would be the introductory motivation part of why doing it that way. Then the characterization shows the real world parameters when applying this theory. Speaking of putting digital parts into the linear region, I remember articles in old soviet amateur magazines about building a radio receiver on a Russian analog of classic 7400. The chip was called K155LA3 according to the soviet naming nomenclature. Adding some smart feedback loops to force gates into the linear region, magnetic antenna and a tuning cap, and there you go, a working LW and MW radio. HF amp, detector and the audio amp – I think they were all made of those four NANDs. Those Russians built some amazing stuff with minimal components. I would love to see that article if you happen to find it. Excellent video!! Please continue to make more like these. I especially enjoyed the complementation of theory and measurements. Thank you for all of the work you do. Why are many photodiode tia created with two opamps? It has something to do with noise I think. Enjoyable video, good harmony between you two. Now I know how to solve a similar problem I had characterising an OTA without information about W/L. What formula and parameters can I use to extract that information from the datasheet?